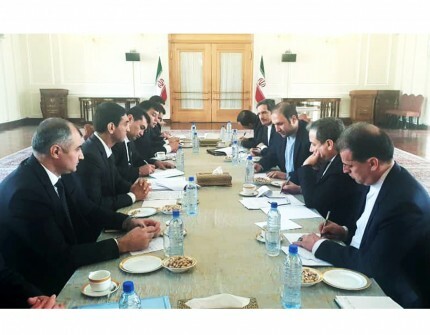 On January 26, 2019, Turkmen-Iranian political consultations were held at the level of deputy foreign ministers of Turkmenistan and the Islamic Republic of Iran in Tehran. During the consultations, issues related to cooperation in the political, trade and economic spheres were discussed. The parties highlighted the important issues of interstate cooperation in the field of energy, transport and trade and discussed a wide range of tasks in these areas. During the meeting, the parties exchanged views on regional and international issues of mutual interest. On January 26-27, 2019, the 14th meeting of the Intergovernmental commission on consular, border and customs issues was held in Tehran. The Iranian delegation was headed by the Deputy Foreign Minister of the Islamic Republic of Iran, Panahi Azar. During the meeting, the parties discussed the implementation of the agreements reached at the 13th meeting of the Intergovernmental commission, which was held in March last year, and the implementation of the upcoming tasks in this direction. In particular, issues of improving the legal aspect of enhancing the mechanism of interaction in consular matters and in the field of information exchange between law enforcement agencies of the two countries, as well as expanding partnerships to establish effective management at border and customs checkpoints, were considered. Following the meeting of the commission, the Final Protocol was signed. Also during the visit, the Turkmen delegation was received by the Minister of Foreign Affairs of the Islamic Republic of Iran, Mohammad-Javad Zarif.